Do not be misled. The many "atomic time" wristwatches you see on the market today are merely cheap quartz wristwatches with a built-in radio receiver. The watch sets itself from 60 kHz VLF radio time signals transmitted by NIST from station WWVB near the US atomic clock in Boulder, Colorado. At least once a day, reception permitting, usually at night, the watch resets itself to compensate for the normal drift of a quartz crystal. The result is a self-setting, radio-controlled, atomic-time, wrist watch that is never off by more than a second or two a day. Impressive and convenient. But these are not atomic clocks. Today we have the first true atomic wristwatch. The definition of a wrist watch is a time piece that can be worn on the wrist, no? 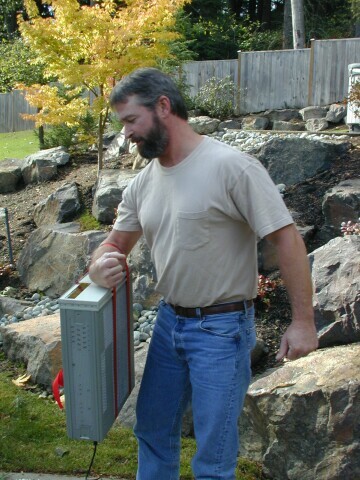 Below is my brother-in-law, Bill, a professional construction contractor, proving that a HP 5071A Cesium Beam Primary Frequency Reference can in fact be used as a wrist watch. You have a choice in stainless steel or adjustable nylon band. Bill's model below has a fashionable double nylon band. Other colors are available by special order. The watch keeps time to a few nanoseconds per day. The attractive display is based on 7-segment red LED technology. Batteries are included (they last about 45 minutes but are rechargeable). AC adapter included. There are no adjustments for daylight saving time; however the clock does handle leap seconds and keeps track of the [Modified Julian] date. This HP wristwatch includes 5/10 MHz and 1 PPS outputs. An internal keypad is used to set the date and time. Not waterproof nor even water resistant. High-performance models available. Contact your Symmetricom  sales office for details. 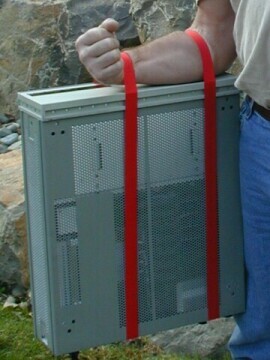 The Hewlett Packard cesium frequency product line was inherited by Agilent Technologies in 1999 and then acquired by Symmetricom in 2005.